I’d like to tell you a story …. Hello, and thanks a lot for dropping in on my author website. If you enjoy reading, then I sincerely hope that you’ll find at least one book here to make your visit worthwhile. There’s everything from a selection of thriller/adventure novels, through to a lighthearted memoir of my time working in the Mad Men world of a major advertising agency. There’s even an illustrated novelette for seven to eleven year-olds set in the Philippines. This one’s for you, Mum. 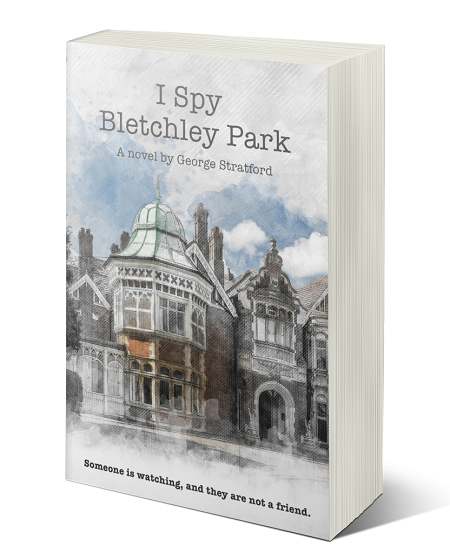 First of all though, I’d like to introduce my most recently completed novel, I SPY BLETCHLEY PARK. Although all events and leading characters are fictitious, this is a personal tribute to my late mother who served as a WAAF for two years at the top secret WWII code breaking centre. Just like everyone else who ever worked there, she never breathed a word about it until all of BP’s incredible achievements finally became public knowledge more than thirty years later. How’s that for keeping Mum? Deeply embittered by the government’s seizure of her financially ruined father’s Buckinghamshire estate, Lady Margaret Pugh swears revenge on all those in Westminster. With World War II looming, Hermann Goering then makes her an irresistible offer if she will agree to spy for him. Before long, the many curious comings and goings at nearby Bletchley Park capture Margaret’s attention. And as she starts putting all of the pieces together, so Britain’s most vital war secret becomes increasingly in peril of a devastating bombing raid. In response to this suspected threat, a young working-class WAAF is thrust untrained into the world of counter-espionage. Thanks to a prodigious musical talent, Betty Hall is uniquely placed to infiltrate Margaret’s private life. But matters escalate, and the fate of Bletchley Park soon hangs entirely on Betty becoming ever more deeply and dangerously involved. With countless lives at stake, two most determined women find themselves fighting a very private war. I SPY BLETCHLEY PARK IS NOW AVAILABLE AS BOTH A KINDLE TITLE, AND AS A PAPERBACK. Find out more about this new novel and all my other books.